The Twentieth Anniversary weekend kicked off on Friday evening with a meet-and-greet session at the Ambassador Conference Resort. 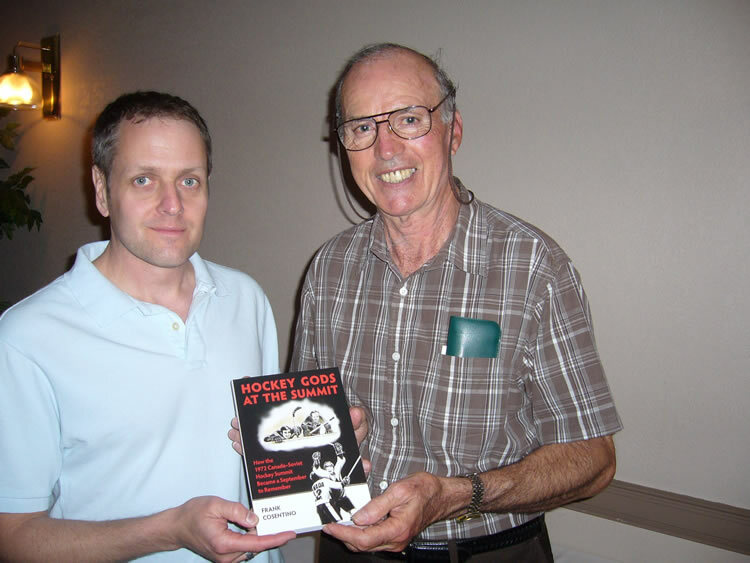 Following a period of socializing, author and former CFL star Frank Cosentino made a presentation on his most recent book "Hockey Gods at The Summit", which is a novel approach for puck historians on the 1972 Canada-Soviet series. The audience was then treated an impromptu address by former St. Louis Blues goaltender and now Lt. Col. Ed Stanieowski, who retold a compelling account of the Stanley Cup visit with Canadian and American troops in Afghanistan. Also in attendance was Major Rob Parent, a former Kingston Junior Hockey Star drafted by the Minnesota North Stars in 1977. Both men were invited by Jake Bartlett of Charlottetown, PEI, in relation to his presentation which was to be delivered the next day. 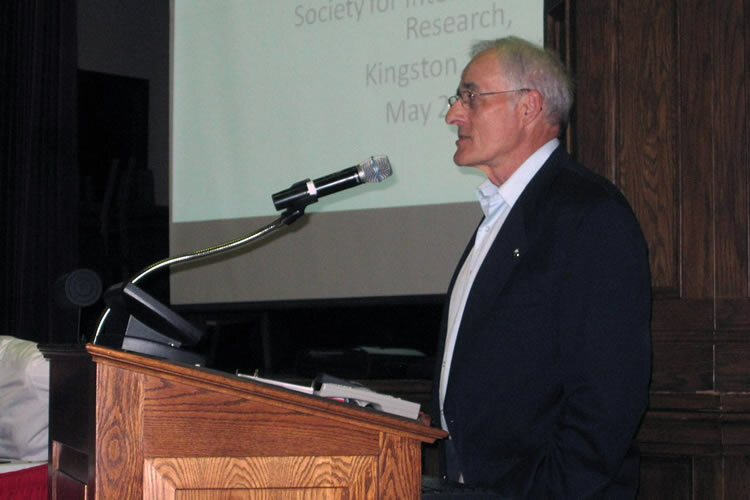 The colonel's talk set the stage for the Annual General Meeting and research presentations which took place at the majestic Currie Hall, on the campus of Royal Military College on Saturday. A welcome message on behalf of RMC was delivered by Professor Emeritus Jack Pike, who detailed the history of the meeting venue. Opened on May 17, 1922, Currie Hall was built to commemorate the deeds of the Canadian Expeditionary Force in the First World War and is a federal heritage building. Located on Point Frederick, just across the harbour from downtown Kingston at the mouth of the Cataraqui River, RMC is one of Canada's pre-eminent heritage and military sites. The college opened in 1876 under the leadership of Canada's second prime minister, Alexander Mackenzie, and it also has a storied hockey history: the sport's oldest ongoing rivalry, between the RMC Paladins and the Queen's University Gaels, dates back to 1886. Members of the Executive delivered reports which showed that SIHR is doing well financially and continues to build on its membership base and public image. Past-President Len Kotylo announced that all of the incumbent officers were acclaimed, negating the need for an election for the positions of regional Vice-Presidents. The group also passed a motion presented by Ernie Fitzsimmons to support a book on early professional hockey prior to the formation of the NHL. 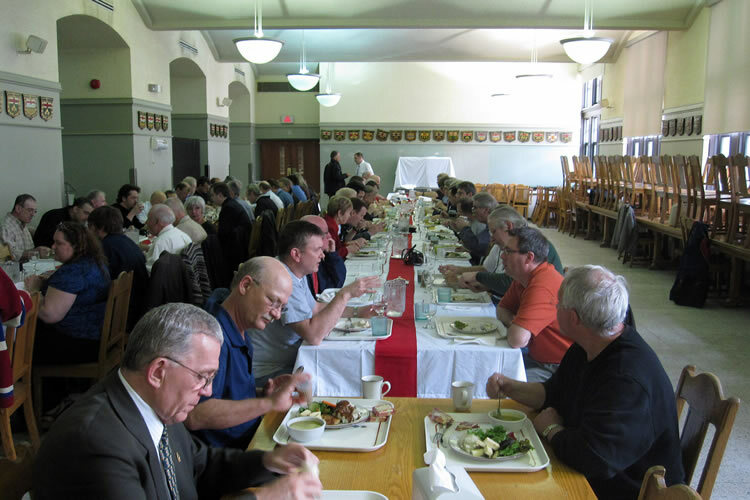 The group recessed for lunch in the RMC mess hall before returning to Currie Hall for the many finely illustrated papers, which featured "NHLers in Military Service" given by Prince Edward Island's Jake Bartlett, Rev. 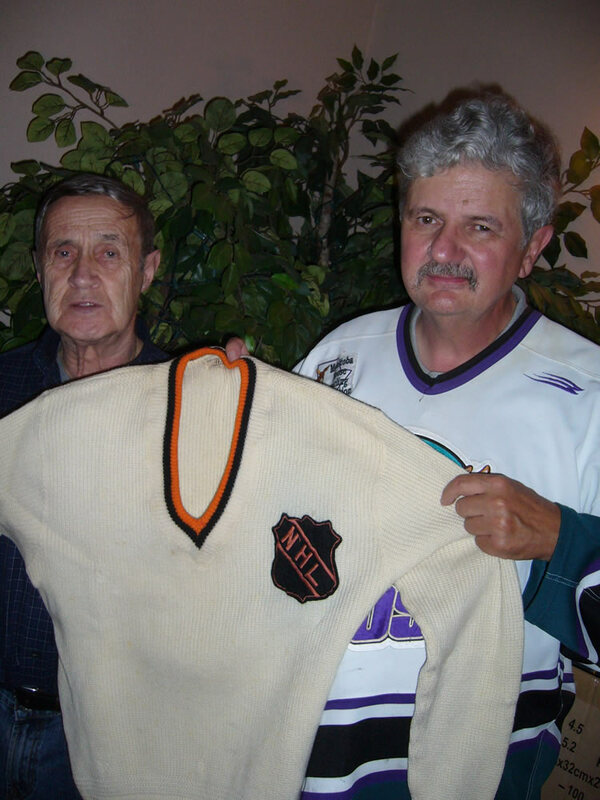 Glen Goodhnd's "The Other Brother, Kevin Slater's "Rivalry and Ringers in Temiskaming: 1905-1907" and Benoit Clairoux's assessment of "NHL vs. WHA Pre-Season Games". Each was effectively presented and provoked good discussions. Honorary President Brian McFarlane was the first guest speaker, and regaled the group with a few stories from his book "From the Broadcast Booth". A panel discussion followed, in which Mark Potter, President of the International Hockey Hall of Fame and Museum, provided a good outline of the original shrine founded in 1943 and its struggle to move downtown to the tourist trail. It complimented the opening tour of the Hall conducted by Beth Duff and her nine-year-old grandson, Josh, enjoyed by sixteen members on Friday afternoon. Bill Oliver, former Royal Military College athletic director, distributed a box of his 2003 book "RMC Hockey History Digest" and used the occasion to announce an agreement to resume the RMC-West Point hockey series in 2012. 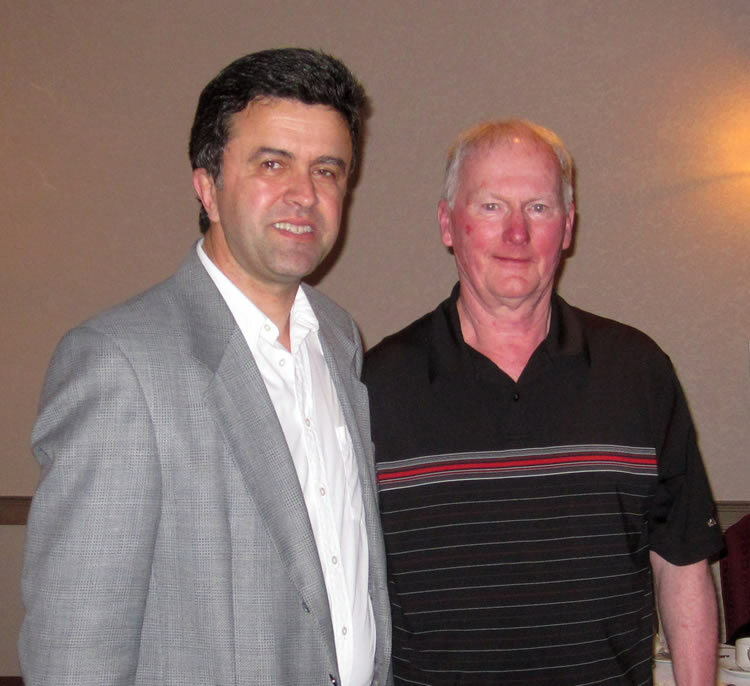 The third panellist was none other than SIHR member and former player Jim Connelly, who discussed his Memorial Cup, Allan Cup and Olympic on-ice exploits. In the evening a group of sixty-four members and guests gathered back at the Ambassador Conference Resort for a banquet honouring the founding members. Following dinner and the ceremonial cake-cutting by co-founders Bill Fitsell and Ed Grenda, President James Milks opened the presentations portion of the evening by retelling how he came to discover SIHR nearly a decade ago. 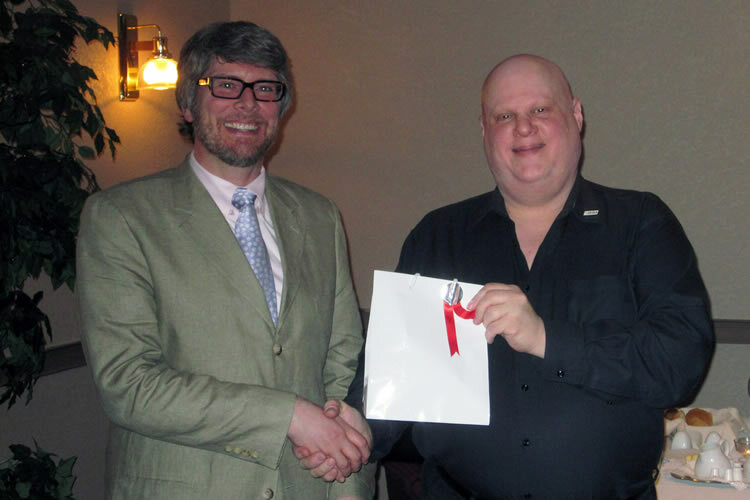 Secretary Lloyd Davis and Treasurer Paul Bruno invited each of the eight founding members in attendance to the front to be presented with engraved pen and personalized stationery sets as a token of the societyâ€™s appreciation for their part in the creation of the group. 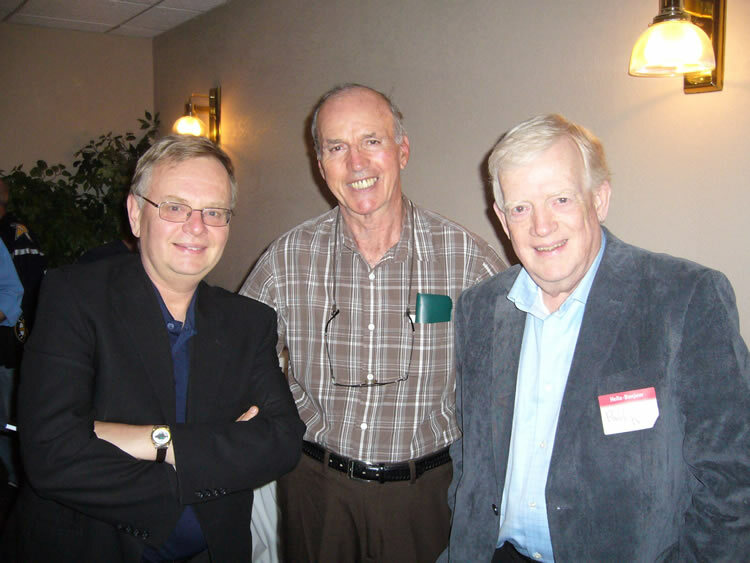 Past-President and founding member Ernie Fitzsimmons took a few moments to remember the three deceased founding members, and recounted his many visits and exchanges of research with the men over the years. Executive Vice-President Jean-Patrice Martel delivered a humorous and insightful presentation on the history of the newsletter, revealing among other facts that it has had a total of eleven names in its lifetime and at least one editor that need a refresher on volume and issue numbers. 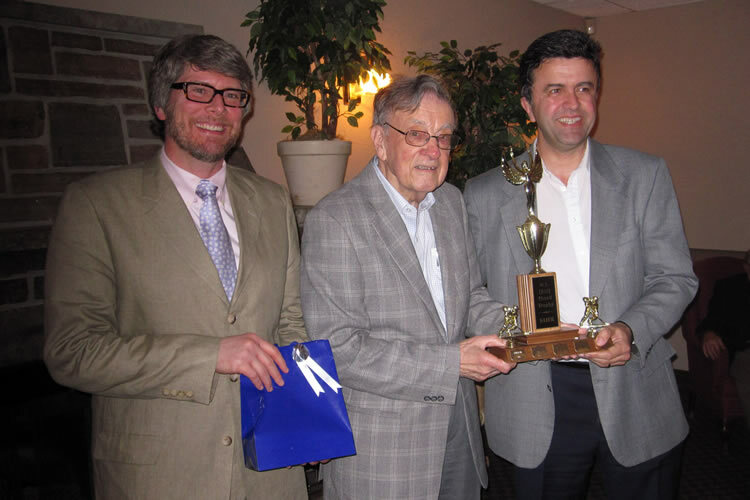 A surprised and touched Bill Fitsell made the group roar with laughter with his comments following the unveiling of the "Fitsell Cup" by Paul Bruno, which will mark the playing of a ball hockey match at each spring and fall meeting of the society. The inaugural game was played the following morning when seventeen members divided into Team Ontario and Team Quebec met in a joyously friendly floor hockey match at the Kingston Military Community Sports Centre. 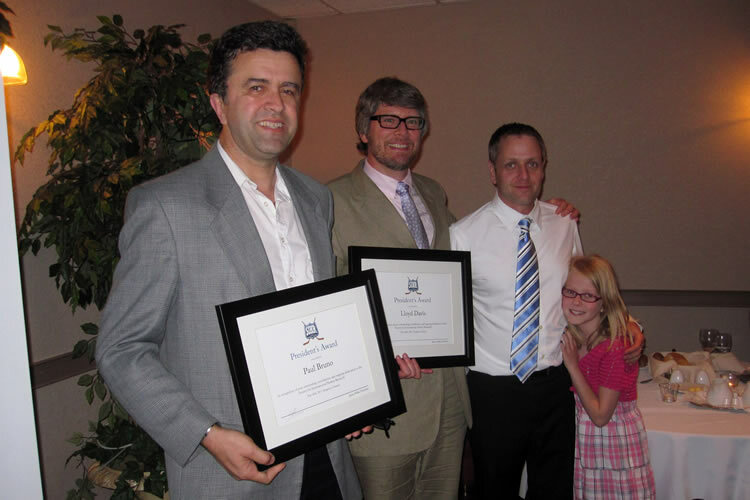 Before the evening concluded, Paul Bruno and Lloyd Davis were announced as the first recipients of the new President's Award, which is to be given annually for "Outstanding contributions to the Society". 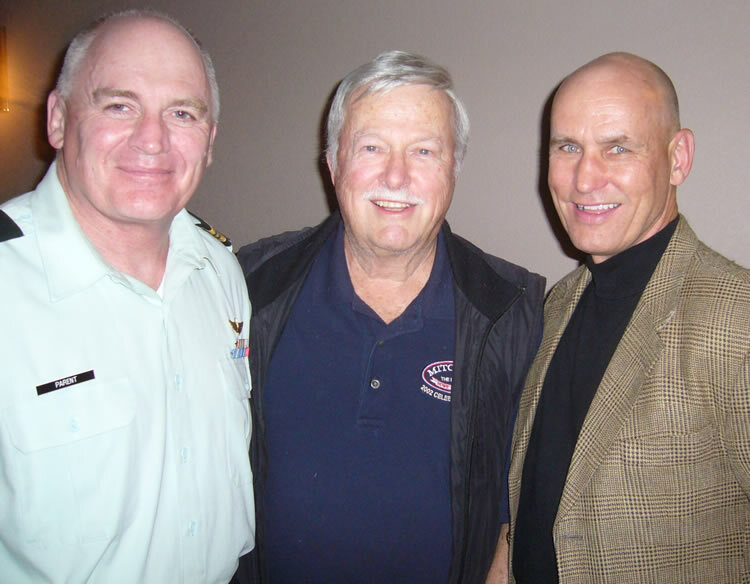 Major Rob Parent, former OHA and IHL player, Brian McFarlane and Lt. Col. Ed Stanieowski, former NHL netminder. 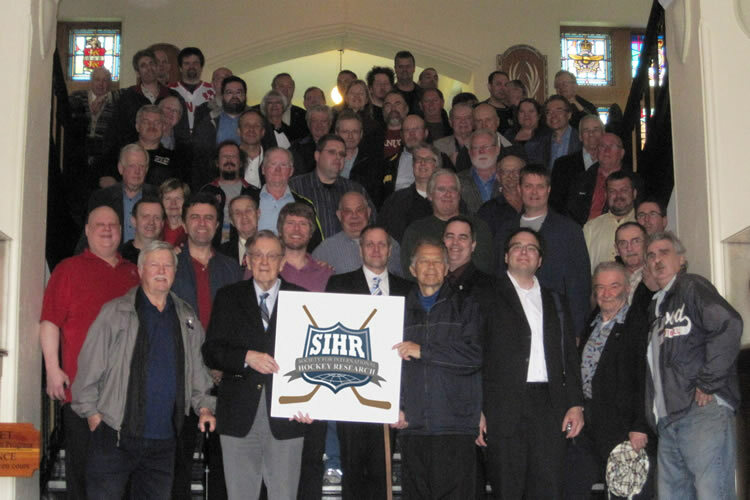 A contingent of 31 members and guests made the trek to Chicoutimi, Que., on the weekend of October 21–23 for SIHR's northernmost meeting to date. 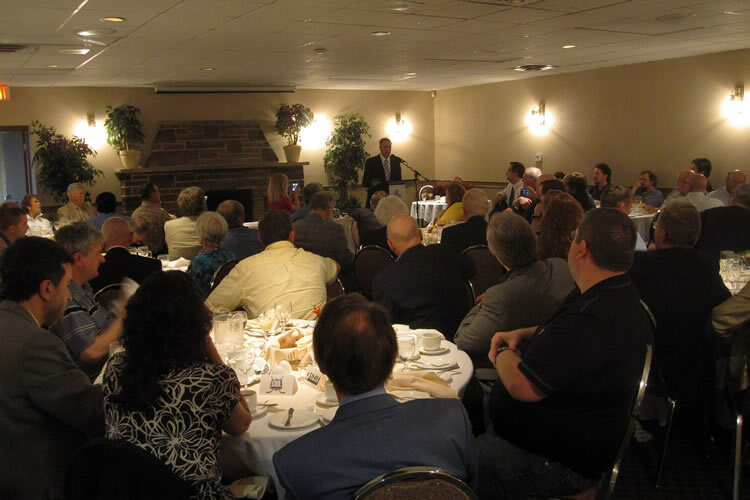 On Friday evening, hosts Stéphane Harvey and Jocelyn Flamand held a meet-and-greet at Hôtel le Montagnais. Many members also took advantage of the chance to watch the hometown Saguenéens hold on to beat the Moncton Wildcats 3–2 at Centre Georges-Vézina. At Saturday's business meeting, graced with the presence of quite possibly the two youngest attendees ever, Sylvie Cook and Christopher Lansdale, President James Milks provided an update on the Ottawa Lord Stanley memorial monument, a project led by Past President Paul Kitchen and founding member Jim McAuley. The committee has reached agreement with the National Capital Commission and City of Ottawa on a site, and will soon seek to raise $5 million and launch a nationwide design competition. Milks acknowledged the work of Past President Lenard Kotylo and Honorary President Ed Grenda in submitting SIHR's successful application for a renewal of the Ontario Heritage Organizations Grant. Kotylo said he simply used the template Grenda had originated, and "just had to plug in new figures." 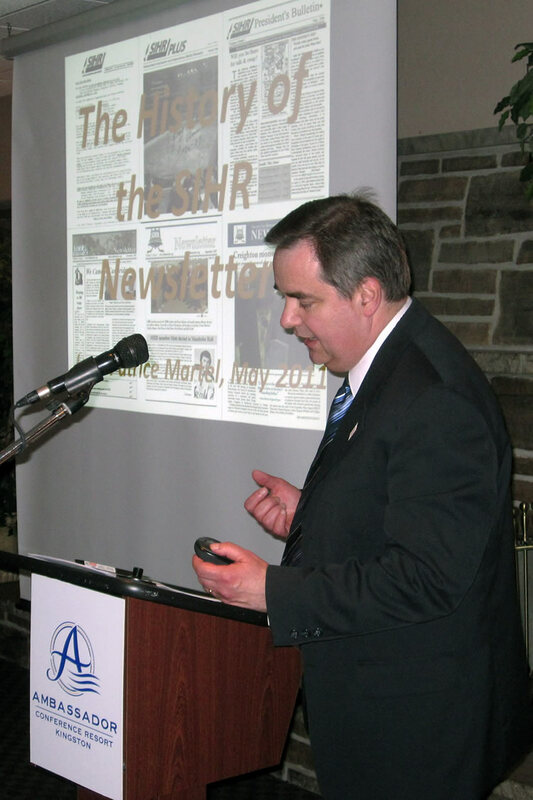 Executive Vice-President Jean-Patrice Martel commented on SIHR's growth in several key areas. More than 50 members hail from Quebec (une douzaine of whom were in attendance), and he estimated that female membership stands at between 5 and 6%. He suggested the time may be right for Montreal to establish a local chapter, as Toronto has successfully done. 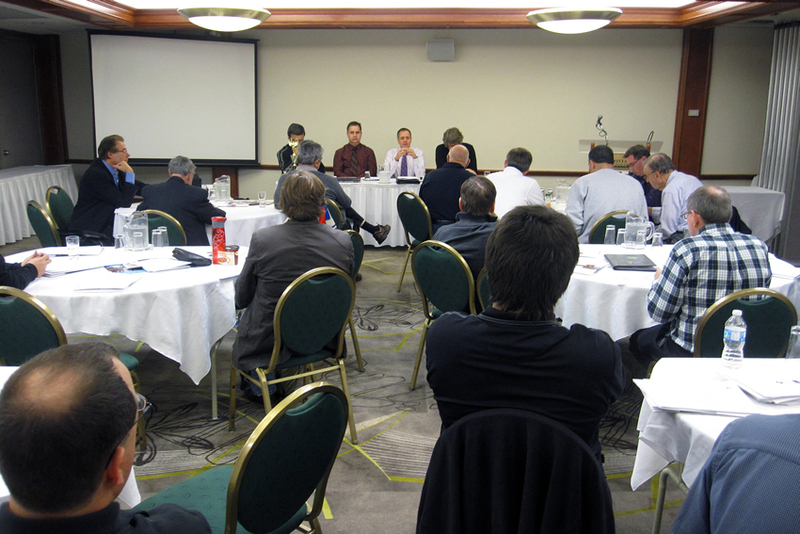 SIHR continues to enjoy a good relationship with the Quebec media. Noting that back issues of the Journal have been digitized and are available to members on the SIHR website. Martel felt it would be helpful to create an index of these articles, an idea supported by Secretary Lloyd Davis. Treasurer Paul Bruno's report underscored the group's solid financial situation, buoyed in large part by a $5,000 donation by Robert Colborne, chair and CEO of Pacific Western Transportation. Milks noted that there was growing pressure to pay suppliers electronically rather than by cheque. A policy was adopted whereby electronic payments drawn from SIHR's PayPal account must be vetted and approved by two of the Society's three signing officers. Davis reported that membership stood at 516 and was particularly robust in Quebec (55) and B.C. (31). Two members had been added from Down Under, while the U.K. was home to 12. Milks, reporting on behalf of the Website Committee in the absence of chair Ernie Fitzsimmons, reported that data input had slowed down. Montreal-area member Nicolas Chabot had approached Milks about automating the addition of the current year's NHL stats. Milks also spoke about quality control and attribution of sources as challenges to be addressed. Milks added that, once his term as president is over, he will work to implement a more user-friendly SIHR website, including the automation of new member accounts. Currently, new members must wait for access to the website. Paul Bennett of Halifax inquired about SIHR's presence in the social media. SIHR already had a Facebook page, but not a Twitter feed. The Facebook "wall" is open to all members to post information. Bennett suggested that a hashtag be created to help Twitter users find and share information about SIHR. 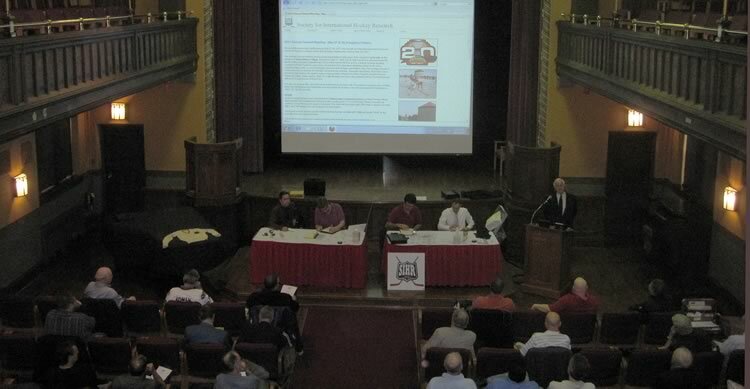 Since the meeting, a Twitter feed has been launched (@sihrhockey), which Davis is administering. 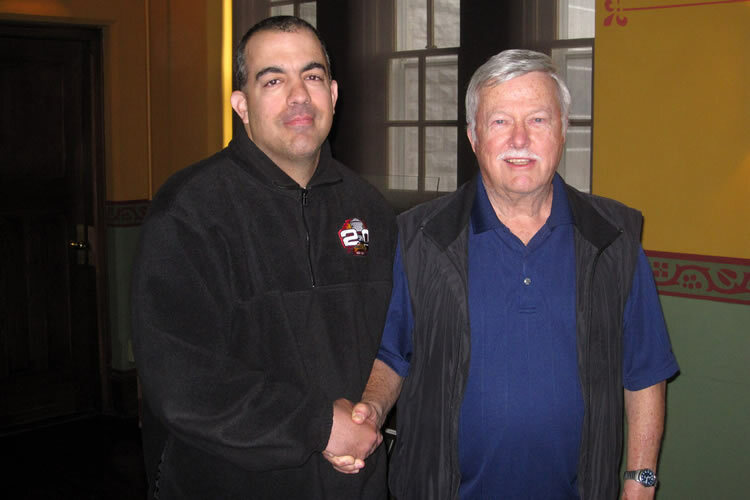 Tidbits about member accomplishments, meeting details, and hockey history in general will be posted. The hashtags #SIHR and #sihrhockey point to information about the Society; others, such as #hockeybooks and #hockeyhistory, will also be of interest. The public is welcome to follow SIHR on Twitter, and the Society has more than 60 followers at press time. Minor Pro Committee chair Jim Mancuso said his group are seeking help with their latest project, "The Greatest Administrators in Minor Pro Hockey." Please contact Jim at +1-315-733-0519 if you can assist. Speaking for Hockey Research Journal editor Iain Fyffe, Mancuso said the Journal team was looking for additional pairs of eyes to help with proofreading. Davis will handle production chores. SIHR's other traditional media outlet, the SIHR Newsletter, was the subject of extensive and at times passionate discussion. Kotylo pointed out that an edition of the newsletter had not been published prior to the Fall Meeting, suggesting that members had not been properly notified of the meeting. Davis responded that more than 90 percent of members have provided email addresses, and were contacted that way several times, beginning on Sept. 8. Information was posted on the website, and letters were sent to those without addresses. He said these notices would have been issued regardless of whether a newsletter had been published, and he felt members had received the same notice as for any previous meeting. Ultimately, a motion was passed directing the Executive Committee to consider and resolve issues surrounding the newsletter. 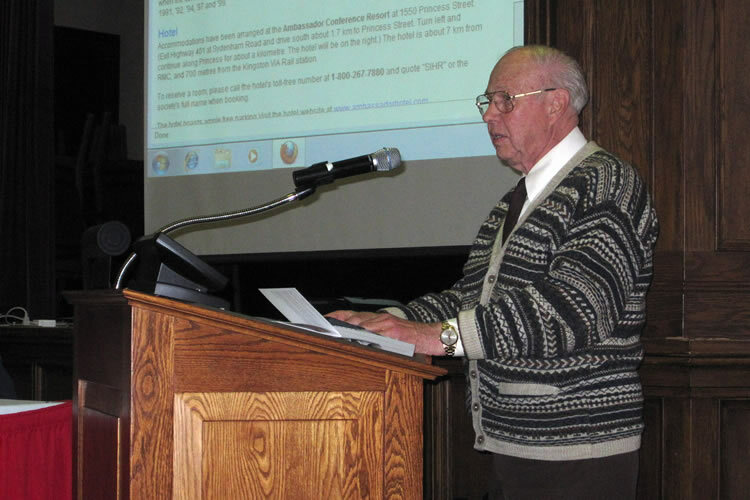 Kotylo spoke about the passing of SIHR member Joe Cronin and said that, like other members, he had amassed a wealth of information. He felt it was incumbent on SIHR to preserve these legacies and recommended that the Society contact heirs and inquire about parts of their collections being donated to SIHR. Potential stumbling blocks included competition from auction sites, the inability of SIHR to issue tax receipts for donations, and the question of where materials would be housed. Just before breaking for lunch, Milks presented Harvey and Flamand with copies of a booklet about Georges Vézina and Jack Darragh, prepared by Paul Kitchen and translated into French. They also received copies of Pucklore and Bill Fitsell's How Hockey Happened. 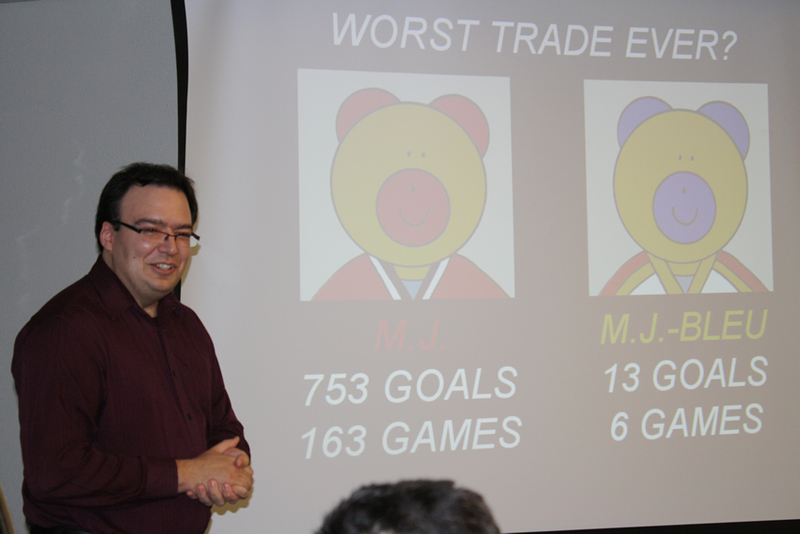 Member presentations were led by what was perhaps the most creative topic in SIHR history: Benoît Clairoux's "Hockey Night in Benville." Richly illustrated with his own artwork, Clairoux documented the table hockey tilts between himself and his older brother over several seasons. It wasn't all fun and games, though: Clairoux's meticulous record-keeping of these matches revealed interesting statistical parallels with NHL hockey. For example, 85% of NHL goals have been scored by forwards, 14% by defenders. In "Benville," the split was an eerily similar 84-15. Monika Moravan gave a talk on Canada's role in the development of Icelandic hockey. She attended the Iceland International Ice Hockey Tournament between October 6 and 9 in Reykjavik; it was the largest hockey tourney in Icelandic history. The event is put together by non-governmental organizations and funded entirely at the grassroots level by participants. Toronto-area hockey player Deirdre Norman organized the tournament, while SIHR member Liz Pead was also involved. 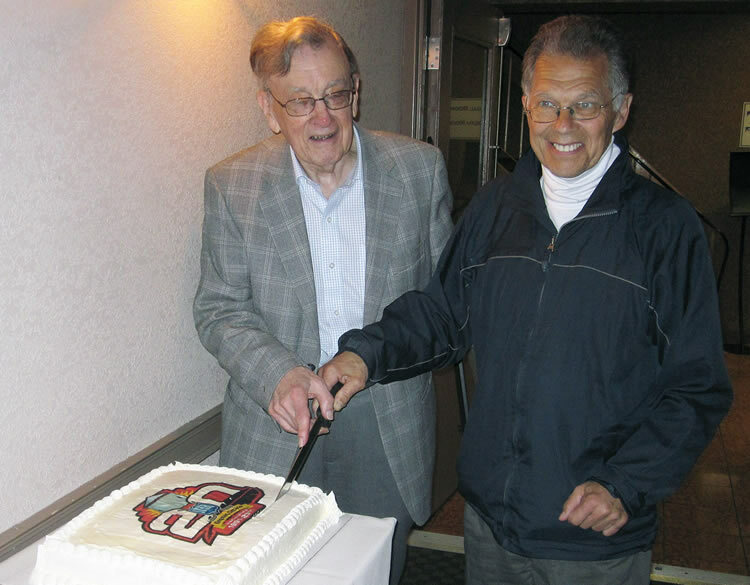 Mancuso ran the anchor leg, with a history of the Central Hockey League, which had commenced its 20th campaign. 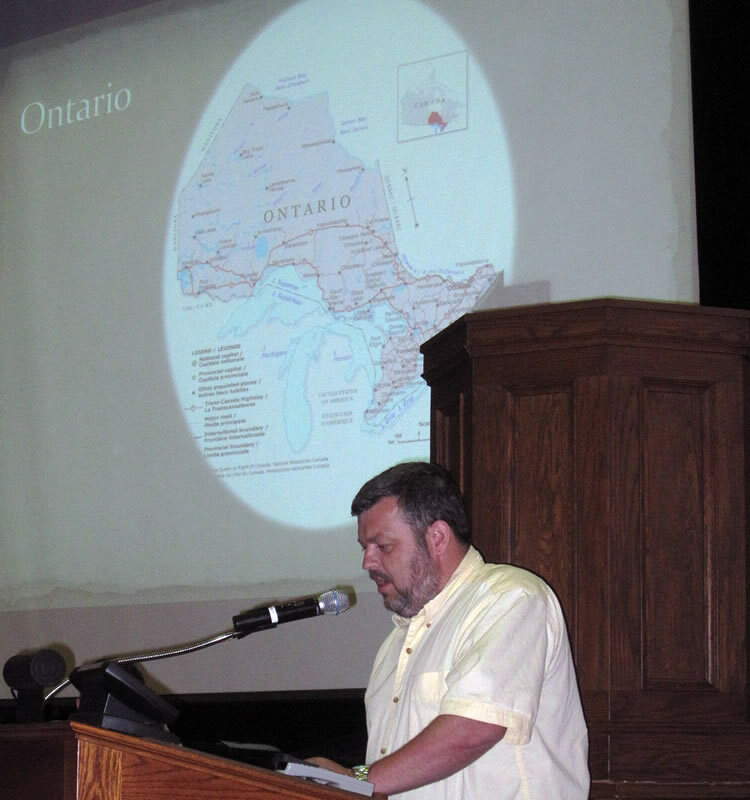 Orillia, Ont., was announced as site of the 2012 Fall Meeting (see story, p. X). Fred Addis, curator of the Leacock Museum, will play host. 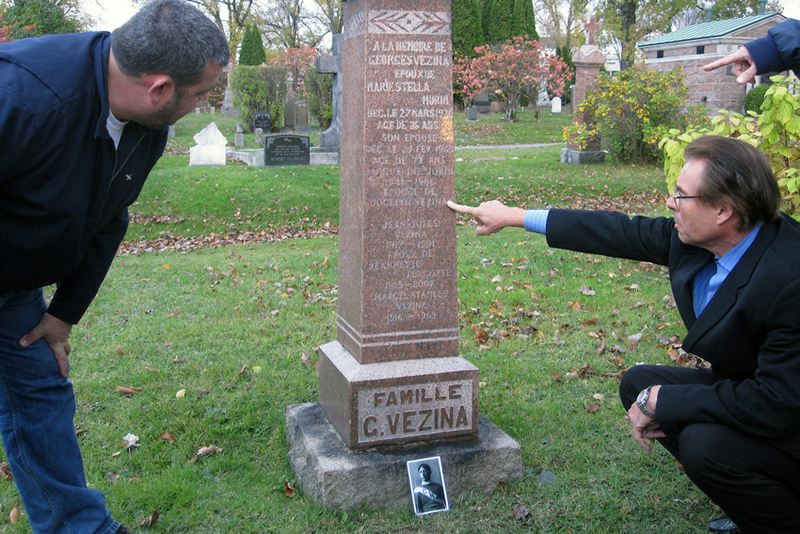 Members then visited the gravesite of Georges Vézina, at nearby Saint-François-Xavier cemetery, where Guy Villeneuve gave a talk. 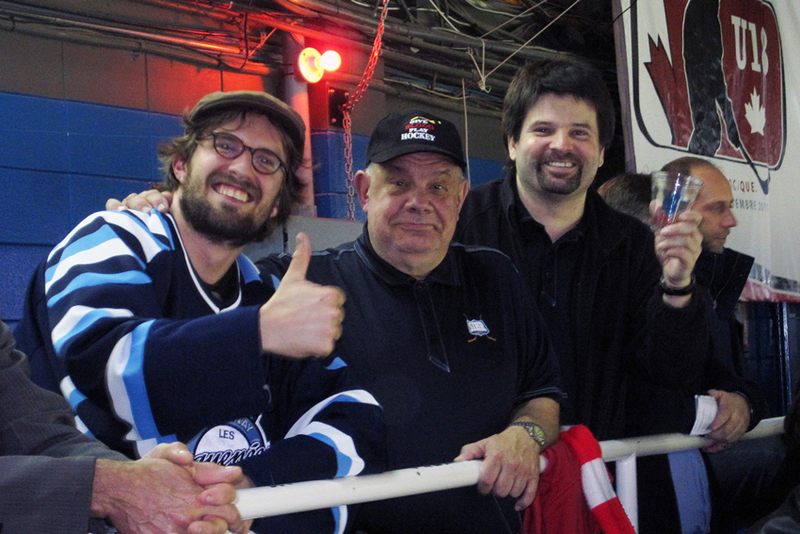 Later, members gathered to watch the Leafs–Canadiens game. Needless to say, emotions were mixed when Toronto prevailed 5–4 in overtime. 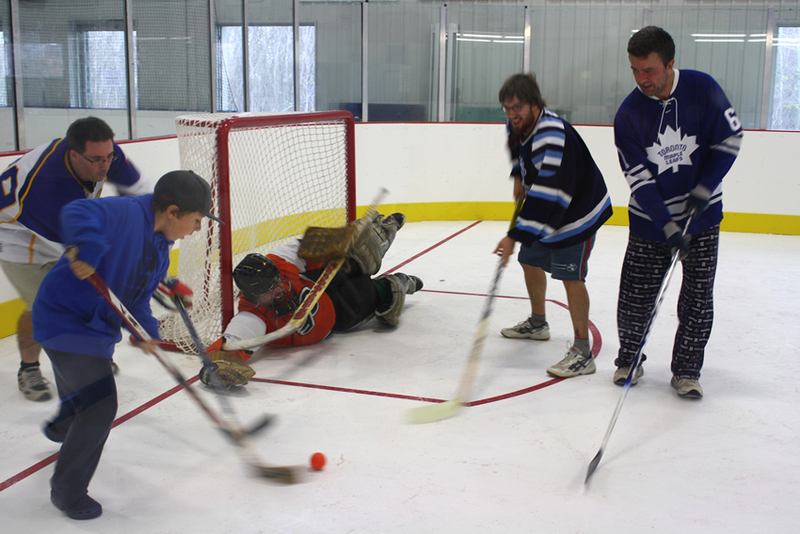 Sunday morning saw Team Quebec and Team Ontario renew their rivalry at the Centre-Optik ball hockey rink. Referee Jocelyn Flamand set the tone with a rousing version of "O Canada," while les Québécois retained possession of the Fitsell Cup.